Occupation: Mature Student & mammy of 2! I didn’t hear that there was a free timed weekly 5k happening 10 minutes from my house until early in 2013 and I walked it for the first time on 4 May 2013 with my 9-month-old in his buggy. I continued to walk parkrun and sometimes brave small jogging intervals but took many breaks from it too which is why it has taken me over 5 years to reach 50 runs. When I got back into jogging after Easter this year by joining a local running group called Sloggers to Joggers in Swords, I was spoilt for choice of parkruns as there are now several in North County Dublin. We have been having fun trying them all out and I have completed 9 different parkrun courses. I look forward to the Sloggers planned parkrun birthday tour where we will travel to parkruns across Dublin celebrating their anniversary runs. Absolutely everything! The community spirit and inclusiveness of the events make them very special. I have made friendships in parks on Saturday mornings and enjoy it as a healthy way to spend time with family and friends. junior parkrun is a wonderful spin off event which we had taken my son to occasionally but had to drive 20 mins to do so. 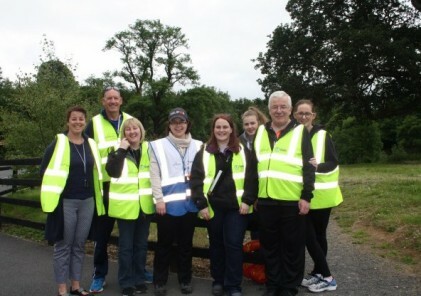 When the opportunity came late last year to join a core team of volunteers and be involved in the set up of the first junior event in Swords, I jumped at the chance to do so. We now have a 5-minute walk to junior parkrun and it is very much part of our Sunday morning routine. Being involved on the Sunday mornings means that I have now volunteered almost as many times as I have run at parkrun. When I can, I run with some of my pals from Sloggers to Joggers who run at my relaxed pace! I love the chats along the way. A lot of the time I do parkrun with my children, pushing my 2-year-old in her buggy and running alongside my 6-year-old. He has completed 33 junior parkruns so is working towards his Ultra wristband and has done 11 of the Saturday 5k parkruns. He has volunteered 7 times also. When I have the kids, my husband gets to run the course at his pace and then other weeks he will have them and let me run on. My 50th parkrun was very enjoyable. I shared the celebrations with two ladies from my running group, one also doing her 50th and the other her 100th. It was the last one before Christmas so there was plenty of Santa hats and festive cheer. My 25th time to volunteer at a parkrun earning my purple t-shirt was at Malahide in July this year. I have done most volunteer roles at parkrun but on this day, I was a VI guide runner for the first time to a visually impaired young lady. I was honoured to be part of her first ever parkrun outing and really enjoyed this role and hope to do it again. During 2018 I have lost some weight and hope to build on this further in 2019. I have also lowered by cholesterol by a couple of points which is positive. Running and volunteering at parkrun and being part of my local community in this way has helped with my confidence also and I feel I am a better role model for my kids now that I am more active than before. 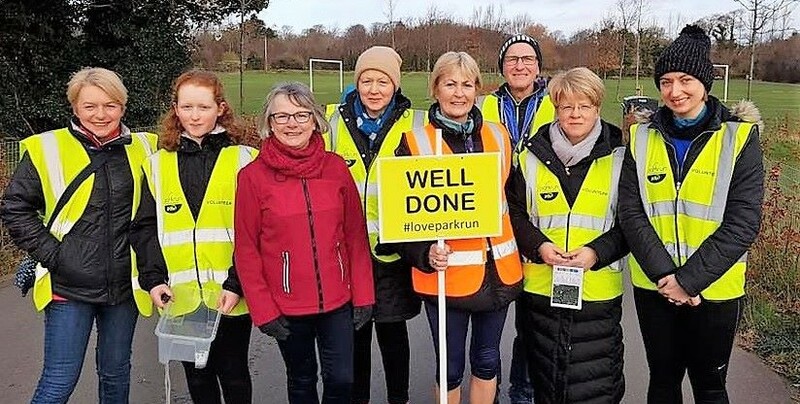 When I did my couch to 5k programme with Sloggers to Joggers for 8 weeks after Easter, our ‘graduation run’ fully jogging 5K was at Malahide parkrun on the June Bank Holiday weekend. I was nervous of jogging the full course but had the company of Catherine, one of our mentors, who slowed down from her normal pace to run with me. She encouraged me and supported me every step and as I got to the finish area I was overcome with emotion and mostly around how I never wanted to go back to a zero level of fitness again. I looked up just as the volunteer gave me my finish token and my little boy was standing right there at the back of the finish tunnel with a big smile and a hug and it meant the world to me. There were happy tears! Oh, there are a few actually! One was at the same graduation run I spoke about above, Catherine and I were targeting under 40 mins for me and close to the finish line a delivery truck was crossing our path and I was worried he was going to ruin this plan! So, I basically charged ahead and put my hand out for him to be the one to stop and wait! I think someone even caught a photo of this! In the end we finished in 38 minutes, so I had time to wait for the truck and still be under 40 but I wasn’t taking any chances. Another funny moment was when I took a break from volunteering at juniors one Sunday to run alongside my son not realising just how much faster he had gotten at the 2k. I just about kept up with him for most of it but forgot about his famous sprint finish from the last corner. He left me for dust and again there is a photo to prove it! There’s no harm in giving it a try. Walkers are more than welcome so don’t feel it is only for runners. It’s such a positive start to your Saturday. You will gain way more than just being able to run a 5k.